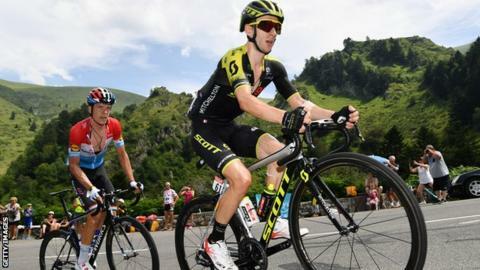 Adam Yates is basing his season around the Tour de France in an attempt to better his fourth place in 2016. The Mitchelton-Scott rider, who won the white jersey as best young rider that year, finished 29th in 2018, more than an hour behind winner Geraint Thomas. "Even though I've got earlier races coming up, in the back of my mind everything I'm doing is build up for the Tour," said the 26-year-old Briton. The 2019 Tour de France starts in Brussels on 6 July. "Last year we made some mistakes that cost us and it was a big disappointment, so it'll be good to go back and rectify that," he added. "Already this year the team has been really committed in all aspects and it just goes to show because the results are flowing. "Even though the Tour is a long way away and there are a lot of races before we get there, it's a good feeling to see the team working so well so early in the season." Yates' best performance at the Tour came in 2016 when he claimed the white jersey towards the end of the first week and defended it to the finish. He ended up almost five minutes behind winner Chris Froome but just 21 seconds behind third-placed Nairo Quintana. "Obviously 2016 was a highlight for me personally," Yates continued. "Riding almost two weeks in the white jersey and eventually finishing fourth on general classification was an amazing experience and confirmed to myself that I can ride at the highest level for three weeks." Matt White, Yates' sporting director at Mitchelton-Scott, believes the mountainous nature of this year's Tour, which features five summit finishes, coupled with just 27km of individual time trialling, will suit his rider. "Adam is one of the best climbers in the world and helping him to put it all together for three weeks on the biggest stage is an exciting challenge," said White. "It is an interesting course with limited time trial kilometres and some very high passes, which have not been seen before in the Tour de France. We are in the mountains quite early and with a team time trial day two we will certainly see the lay of the land quite early in proceedings." Despite a top-10 finish in last year's Giro D'Italia, it remains the British rider's best result at a Grand Tour while twin brother Simon won the 2018 Vuelta a Espana.